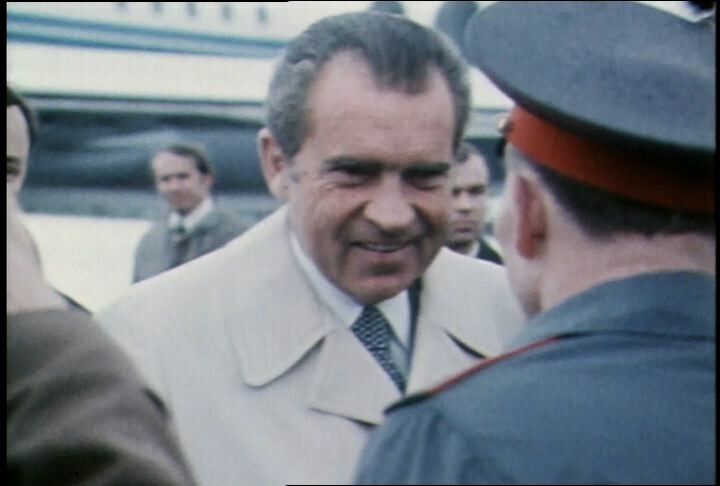 Color footage of President Richard Nixon on the tarmac, meeting people in Russia in May, 1972. Chicago: “War and Peace in the Nuclear Age; One Step Forward; Nixon Arrives in Russia,” 05/01/1972, WGBH Media Library & Archives, accessed April 25, 2019, http://openvault.wgbh.org/catalog/V_60FDD5BCA7C94CD58DB2B1BAAFEE087D. MLA: “War and Peace in the Nuclear Age; One Step Forward; Nixon Arrives in Russia.” 05/01/1972. WGBH Media Library & Archives. Web. April 25, 2019. <http://openvault.wgbh.org/catalog/V_60FDD5BCA7C94CD58DB2B1BAAFEE087D>.